At the risk of giving in to temptation and mentioning last week's supposed 'blue Monday' in a New Order headline, we've opted instead to make it crystal clear. 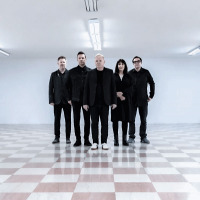 Puns aside, the long-awaited news that New Order are going to follow up their recent Troxy dates and European jaunt will undoubtedly conjure up similarly composed tag-lines, blog-headers and remarks from pretty much anyone in the music press. Whilst a rather undignified war appears to be raging between co-founders Bernard Sumner and Peter Hook over who should be allowed to trade under the name 'New Order', news of live UK shows might quell fans' fears of the band's frontman buckling under the wagging finger (and legal actions) of the erstwhile bassist - not so. Four UK shows have just been announced for the spring, starting with Manchester on 26th April, followed by Birmingham, Brixton and Glasgow. Tickets will go on sale from Friday at 9am (£35 for London, less for regionals) and demand is expected to outstrip availability. With a few gaps in the diary either side of the shows, you can presume that extra shows may be added to satisfy demand, or new venues. Either way, there will be a rush of sorts. New Order's other 2012 activities involve a handful of festivals around the globe, including European stops in Spain and Serbia at Benicàssim 2012 and Exit Festival 2012 respectively - tickets are still on sale for both. For the UK shows, you can expect a set-list jammed with huge hits ('True Faith', 'Regret' etc) and fan favourites (just about everything else). Now wouldn't it be wonderful if they all just made up? As you would probably expect, just one Manchester date would never have been enough to satisfy New Order fans, and tickets for the initial date were snapped-up pretty sharp-ish. A second date (Friday 27th April) has just been added and a second Brixton date has also been added (3rd May). Both on sale now.